An amazing discovery in Alaska could have big implicates for climate change. 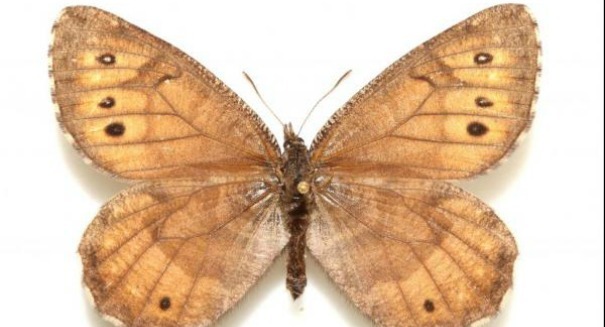 Scientists in Alaska have made a remarkable find: a new species of butterfly that is the first discovery of its kind in 28 years, and it could be indicative of the future with climate change and global warming. The species is a hybrid of two ancient species that has adapted for life in Alaska’s interior, according to a University of Florida statement. It’s called the Tanana arctic (Oeneis tanana), and it is believed to evolved from the offspring of two butterflies: O. chryxus and O. bore shortly before the last ice age. Chryxus moved south to the Rockies due to the ice age, whereas the Tanana arctic and O. bore white-veined arctic stayed in Alaska. The Tanana arctic today appears to live in the Tanana-Yukon River Basin, seeking shelter in the spruce and aspen forests. The Tanana arctic looks similar to other species, so scientists hadn’t noticed it until now. The butterfly is larger and somewhat darker, and has white freckles. Why is the butterfly useful to climate scientists? Because butterflies in particular are very sensitive to changes in the climate. This butterfly has been living in the Tanana River valley for a long time, so scientists will be watching it closely: if it leaves permanently, that will be a sign that there are big changes coming. “Hybrid species demonstrate that animals evolved in a way that people haven’t really thought about much before, although the phenomenon is fairly well studied in plants,” University of Florida lepidopterist Andrew Warren said in the statement. “Scientists who study plants and fish have suggested that unglaciated parts of ancient Alaska known as Beringia, including the strip of land that once connected Asia and what’s now Alaska, served as a refuge where plants and animals waited out the last ice age and then moved eastward or southward from there. This is potentially a supporting piece of evidence for that.